Navy Bombing of Vieques Suspended | Democracy Now! Defense Secretary Donald Rumsfeld last week ordered the Navy to suspend its bombing of Vieques for the month ofMarch. The order came two days after Puerto Ricans launched a new effort for an immediate and permanent end to thecontinued US bombing of the island. 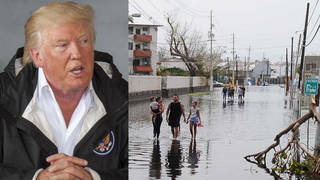 In a new tactic, some 160 Puerto Ricans and supporters lobbied Congress lastweek, and Puerto Rican Governor Sila Calderon asked Secretary of Defense Donald Rumsfeld to halt the naval exercisesuntil he reviews a study linking the bombing to health problems among residents. The Navy had for decades used live bombs on Vieques until the 1999 killing of a civilian caused popular discontent toexplode. Protesters swept into the bombing range and occupied it for over a year, until the Navy expelled them lastMay. Then the Puerto Rican governor and President Clinton formed an agreement under which the Navy could continue trainingwith inert bombs until a November referendum on the issue. But popular discontent has remained high, and GovernorSila Calderon won on a platform which included the immediate ousting of the Navy. Activists and analysts disagree on the significance of the one-month suspension: some hail it as the first of severalvictories; others call it a delay tactic at best and a ploy to win the November referendum at worst. Dr. Emilio Pantojas, Sociologist and Senior Researcher, the Center for Social Research in San Juan. Juan Manuel Garcia Bassalacque, Senior Political Analyst for the San Juan Star, WAPA (television)and WUNO (radio).